JK and I went for a walk today. When KD left this morning to go to his brother's stag (paintballing is the thing to do for Christian stags around here), he made me promise that we would get out of the house and go for a walk. I decided to go to Value Village. It's about 20 minutes away walking. The only thing I saw there that I might have bought is a pretty cream-coloured cake plate. But they wanted $15 for it, and I knew that I could get the same thing for the same price or less at Home Sense, brand new! So I left it. We don't have the counter/cabinet space for a cake plate right now anyway. Value Villiage is often overpriced like that. Goodwill is much better. Since Home Sense was on the way home, I decided to stop in there just for fun to see if I was right about the cake plate. And I was! I found two very similar white cake plates for the exact same price. And a glass one for only $7.00! So if I were desperate for a cake plate, I know where I'd go! 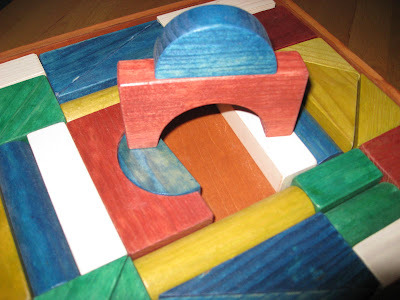 I bought some wooden Mellisa and Doug building blocks for JK. I've heard about their non-toxic wooden toys before. I think she'll like them, even if just for banging together. 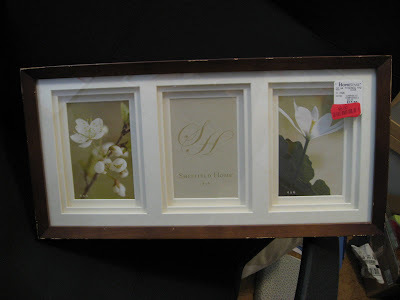 I also found a picture frame for $5.00 It was originally $12.00, but the frame is scratched and chipped. I thought it was great, since I won't have to do the distressing myself! I have been wanting a frame like this for the bathroom. I really like the stock photos that are already in the frame, so I'll have to see what I can do to duplicate the look. I think I was bad today. I stole some roses from someone! They were growing through the fence by the sidewalk. I know that if a neighbour's tree branch is growing into my yard I would have the right to cut it off, but I'm not sure how that rule applies to public property. Anyway, the roses were really thorny, so I think I got my punishment. 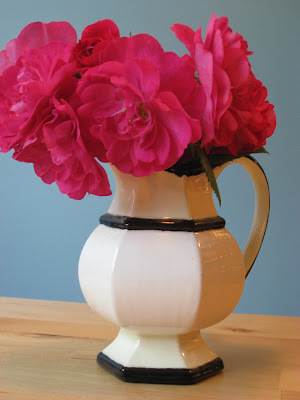 But they sure are pretty in my little jug! I love the blocks. I still have the blocks that my oldest son played with, but I am sure they are full of lead or something deadly and dangerous. Actually, I still have my very own wooden doll house furniture. Anyway, stealing roses? Paintballing Christians? Oh, you will be warmly welcomed in any new neighborhood! I agree with you about Value Village. It is overpriced. Really pretty roses! You got some great finds! Love the blocks.